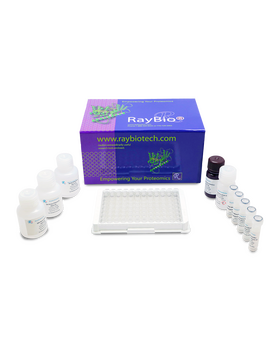 RayBio® Human IL-13 ELISA Kit for cell culture supernatants, plasma, and serum samples. 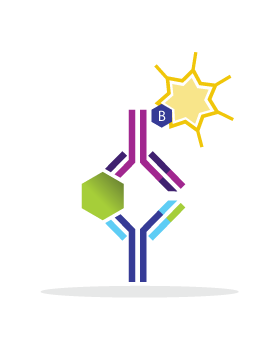 This ELISA kit shows no cross-reactivity with any of the cytokines tested: Human Angiogenin, BDNF, BLC, ENA-78, FGF-4, IL-1 alpha, IL-1 beta, IL-2, IL-3, IL-4, IL-5, IL-7, IL-8, IL-9, IL-10, IL-11, IL-12 p70, IL-12 p40, IL-15, I-309, IP-10, G-CSF, GM-CSF, IFN-gamma, MCP-1, MCP-2, MCP-3, MDC, MIP-1 alpha, MIP-1 beta, MIP-1 delta, PARC, PDGF, RANTES, SCF, TARC, TGF-beta, TIMP-1, TIMP-2, TNF-alpha, TNF-beta, TPO, VEGF. Gao S., Zhou J., Liu N., et al. Curcumin induces M2 macrophage polarization by secretion IL-4 and/or IL-13. J Mol Cell Cardiol. 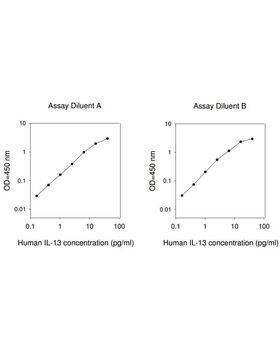 2015 Aug;85:131-9. doi: 10.1016/j.yjmcc.2015.04.025. Hashad RA, Hamed NA, El Gharabawy MM, et al. 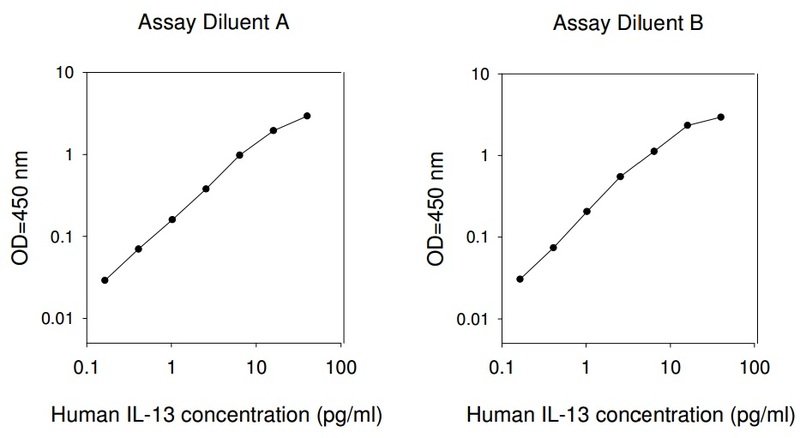 Interleukins 12 and 13 levels among beta-thalassaemia major patients. East Mediterr Health J. 2013;19(2):181-185. Nagayoshi, Masaru, et al. "Inhalation of Stachybotrys chartarum evokes pulmonary arterial remodeling in mice, attenuated by Rho-kinase inhibitor." 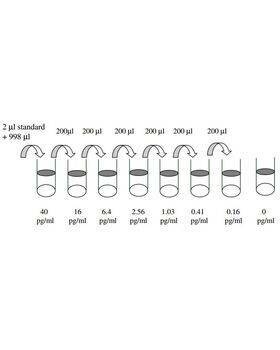 Mycopathologia 172.1 (2011): 5-15. Iikura, Katsuhito, et al. 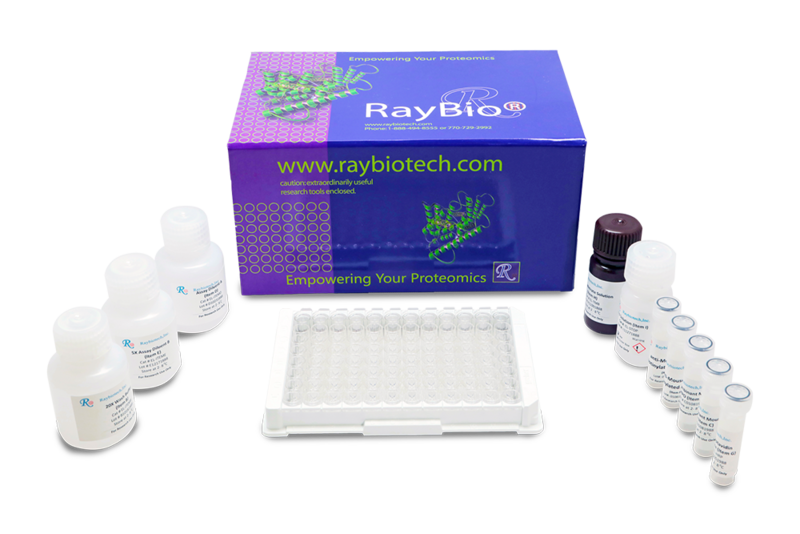 "Peripheral blood mononuclear cells from patients with bronchial asthma show impaired innate immune responses to rhinovirus in vitro." International archives of allergy and immunology 155.Suppl. 1 (2011): 27-33. RA, Harfoush, and Elgharabawy MM. 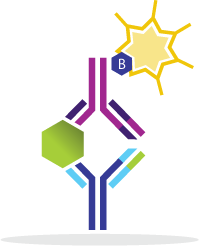 "Levels of interleukins 12 (IL-12) and 13 (IL-13), hepatitis B and C serology, and blood cultures among acute myeloid leukemia (AML) patients in Egypt." Journal of Venomous Animals and Toxins including Tropical Diseases 17.3 (2011): 293-299.